If you have recently started using an application called LinkWiz, you should reconsider your decision, because it has been classified as an infection by numerous security analysts. Therefore, we are of the opinion that you should remove this application regardless of whether you find it useful. The main problem with this app is that it displays unreliable advertisements that could infect your computer with various types of malware. On top of that, the application has the ability to gather information about the user of the infected PC. So that is why we encourage you to take action and remove this unreliable program. For those who are unaware, this program can be downloaded from a website called Linkwizapp.com. The main website features a streamlined minimalistic design, which gives it a legitimate look. At this stage it is not yet known if this infection is disseminated using other methods such as software bundling. In any case, LinkWiz is not the first of its kind. It comes from a long lineage of similar infections, such as Highlightly, Quiknowledge, SearchSnacks, and TermTutorm, among others. The aforementioned infections are now rather old, yet they might still be active, so you definitely should remove them as well. LinkWiz might look appealing to those users who like their browsers to have lots of bells and whistles, but the application is not that useful. If you install this application and start using it, you will notice that each time you highlight a word or a combination of words on a webpage a small icon will appear. If you click the icon, an in-page window will appear. The window consists of three tabs. The first tab features a Wikipedia search engine, which automatically shows search results for the highlighted text. The second tab features a translation tool that actually works. The third tab features a thesaurus window that showed no results at all. This application may appear to be useful to some, but, nonetheless, it is still an infection, because it shows third-party ads that are known to redirect users to infected websites. These infected websites contain malicious applications that could be downloaded onto your computer without your knowledge. Note that your computer could be infected with spyware, Trojan downloaders, Trojans, browser hijackers, and other infections that could be difficult to remove. In addition to that, the application could collect information about your browsing habits, such as browsing and search history. So, if you wish to protect your computer from potential security threats, such as malware and spyware, you should remove LinkWiz from your computer as soon as possible. Failure to do so might severely jeopardize your system’s security. We have prepared a step-by-step guide that will help you remove this infection. 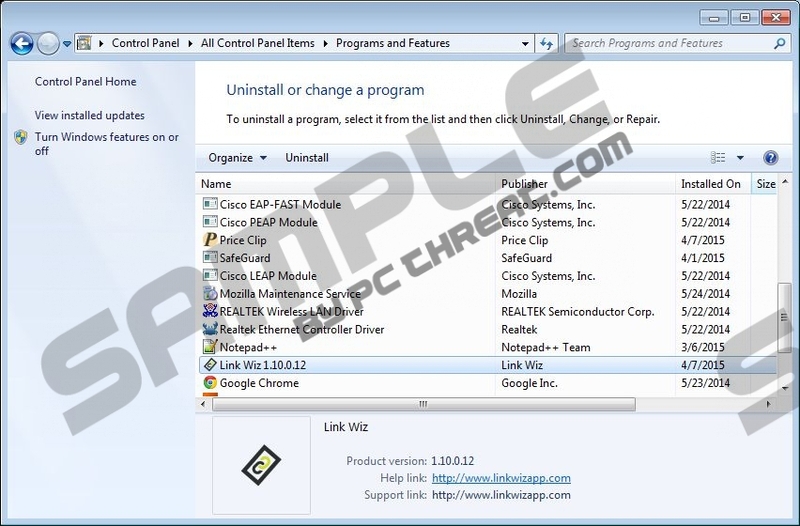 Find LinkWiz and click Uninstall. Quick & tested solution for LinkWiz removal.